영어로 막힘없이 대화하기 03. Bon voyage! 16 9월 영어로 막힘없이 대화하기 03. Bon voyage! 외국인 친구가 여행을 간다고 가정해보자. 어떤 말로 인사를 건네는게 좋을까? 어떤 말을 던졌다 해도, 그 이후에 어떻게 대화를 이어나가야 할까? 영어로 대화를 시작하고 정적이 흐른다면, 육하원칙 의문사를 사용하여 대화를 이어나갈 수 있다. 영어로 대화를 이어나가고, 다시 대답을 하고 반문을 하는 것도 요령과 기술이 필요하다. 영어 초보도 끊기지 않는 대화를 할 수 있다. 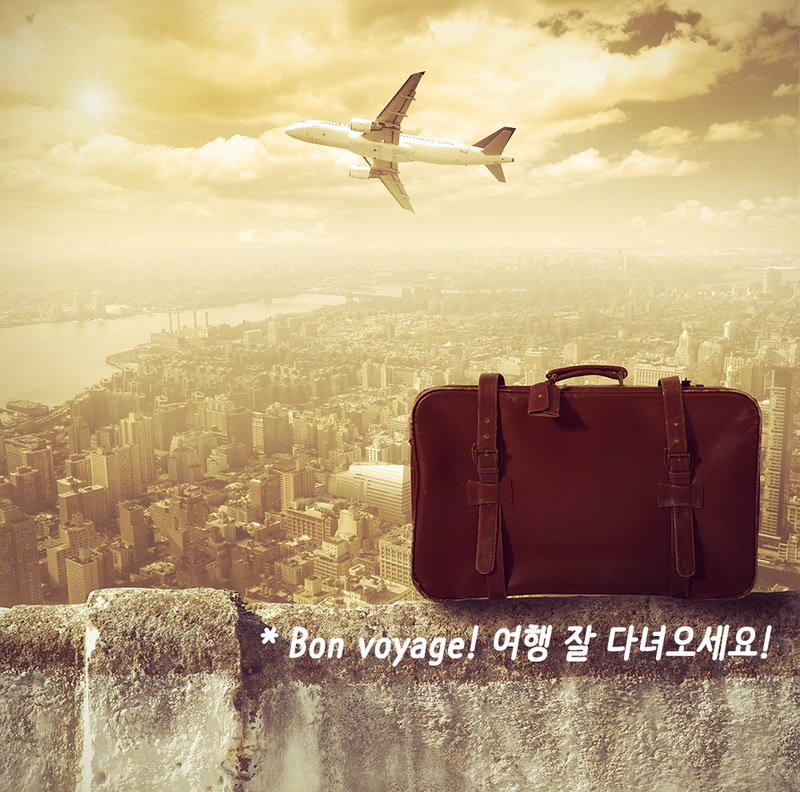 주제 3 Bon voyage! 여행 잘 다녀오세요! 주변에 여행을 가는 이에게 어떤 인사를 하면 좋을까? 다음의 내용에서는 ‘여행’이라는 대화하기에 좋은 소재와 대화를 이어나갈 수 있는 육하원친 의문사 대화법 요령을 담고 있다. 질문과 역질문, 그리고 실제대화를 통해 기술을 적용해보자. 1)What is the best trip you have ever had? 지금까지 가장 좋았던 여행이 무엇인가요? 2)Who do you like to travel with? 3)Where would you like to travel to next? 다음에는 어디로 여행 가고 싶으세요? 4)How often do you travel abroad? 1)Do you like to travel? 여행하기를 좋아하세요? 2)Is Korea a good place to travel in? 한국은 여행하기 좋은 곳인가요? 의문문을 평서문으로 바꾸면 간단한 문장으로 대답할 수 있다. Q. What is the best trip you have ever had? 지금까지 가장 좋았던 여행이 무엇인가요? A. The best trip I have ever had was to (____) I went there (___). 지금까지 (___)에 간 여행이 제일 좋았어요. 거기에 (___)갔었어요. Q. Who do you like to travel with? 누구와 여행하는 것을 좋아하세요? A. I like to travel with (____). (____)와 여행하는 것을 좋아해요. Q. Where would you like to travel to next?다음에는 어디로 여행하고 싶으세요? A. I would like to travel to (____) next. 다음에는 (____)로 여행 가고 싶어요. Q. How often do you travel abroad? 해외여행을 얼마나 자주 하세요? A. I travel abroad (______), (_____) 해외여행을 해요. Q. Do you like to travel? 여행 좋아하세요? ① I like to explore different cultures and try new culsnes 다양한 문화를 탐험하고 새로운 음식을 먹어보는 것을 좋아해요. ② I like adventure and I love to meet new people 모험을 좋아하고 새로운 사람들을 만나는 것을 좋아해요. ① I am not a fan of adventure and I am not an outdoor person. 모험을 좋아하지 않고 밖에 나가는 것을 싫어해요. ② I prefer to stay home and rest during the holidays. 쉬는 날 집에서 쉬는 것을 선호해요. Q. Is Korea a good place to travel in? 한국은 여행하기 좋은 곳인가요? ① there are numerous historical monuments. 유적이 많아요. ② the local people are kind and friendly. 현지인들은 친절하고 상냥해요. ① most of the signs are in Korean. It is difficult to find the way. 거의 모든 표시가 한국어에요. 길을 찾기가 어려워요. ② travelling expenses are higher than most other Asian countries. 대부분의 다른 아시아 국가들보다 여행비가 많이 들어요. James Min, how was your holiday? What did you do? Min It was amazing. I went to Thailand with my husband. We had a blast. Min Yep. We love to travel. Do you like to travel? James Sure. I also love to travel aboad. Min Oh, really? How often do you travel abroad? James Well, I guess I try to go abroad at least once a year. Min Good for you! You must have been to many places. What is the best trip you have ever had? James The best trip I have ever had was to Spain. I went there a few years ago. Min I really want to go to Spain . Who did you go with? James I went with my best friend. Who do you like to travel with? Min Me? Hmm, I like to travel with my family. So James, where would you like to travel to next? James I’m planning to go to Greece next summer. I have always wanted to go there. Min That sounds amazing. In your opinion, is Korea a good place to travel in? James Well, yes and no. Korea does have many historical monuments that are very interesting to see, but it is difficult for foreigners to find there way because sometimes there aren’t any English signs. 상대방의 질문을 베껴 거침없이 대답한다!